A Quote-If you want me to run some medical supplies, I'm in. If you want someone to smuggle spice, I can point you to some people for a fee. If you want Boggins killed, I'll do it for free! 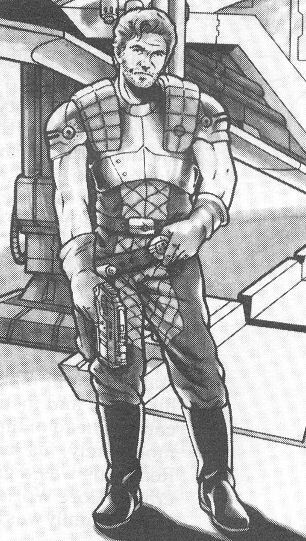 Blast vest (+1D physical, +1 energy, torso only), heavy blaster pistol (5D), visual wristcomm, backup comlink and his ship the Outrider II. A quintessential Corellian smuggler, Dash Rendar's time in the galactic spotlight was cut short by his sudden and shocking death -- or so he would have you believe. Dash was known to the underworld fringe types for years. He and Lando Calrissian first met on at the sabacc tables on Kaal. He met Han Solo during a respite on Port Haven, a secret smuggler's port on an uncharted backwater world. The three would exchange stories of evading the Imperials, telling tall tales full of bravado and bluster. Calrissian and Solo eventually outgrew the smuggler life, going "respectable" and throwing their lot in with the Rebels. Dash declined, preferring to focus his attention on the one thing that truly mattered: himself. But for all the ego, Dash did have a streak of nobility hidden beneath his chiseled good looks and muscular build. Dash fostered a personal grudge against the Empire. Dash's childhood was a privileged one. His family owned RenTrans, a growing and successful shipping company in the Core Worlds. He was an ace student at the Imperial Academy at Carida. One dark day, the life of prosperity came literally crashing down in flames. Dash's brother, Stanton, was a pilot in the RenTrans fleet. Tragedy struck on what was to be a routine liftoff from Coruscant. A blown out control system sent Stanton's freighter careening into a private museum owned by no less than the Emperor Palpatine. Stanton was killed in the crash. Enraged at the loss of his priceless Jedi and Sith artifacts, Palpatine banished the Rendar family and transferred their holdings to the rival Xizor Transport Systems. Dash picked up the pieces of his life in the fringe, becoming a capable smuggler. With an unlikely droid partner, LE-BO2D9, Dash flew his souped up YT-2400 freighter, the Outrider. Though he tried to remain neutral in the Galactic Civil War, Dash found himself taking on food-shipping duties for the struggling Alliance. Entrusted with the location of their secret base, Dash even delivered supplies to Hoth, where he once again ran into Solo. Rendar was stuck on Hoth when the Empire attacked. The pilot bravely took to an unmanned snowspeeder and participated in the delaying actions against the Imperial AT-AT walkers. Escaping Hoth in one piece, Rendar rejoined the Rebels after Han Solo's capture. As a favor to Lando, Rendar helped the Rebels in their search for Solo, pursuing IG-88 to Ord Mantell and Boba Fett to Gall. Though Leia Organa was grateful to Dash for his help, she nonetheless found the Corellian's smug attitude unbearable. She tasked him to protect Luke Skywalker, whose life was threatened by agents of Black Sun. Together, Dash and Luke helped Bothan spies secure the Death Star plans from the Imperial freighter Suprosa. Dash later helped Luke and Lando infiltrate Prince Xizor's palace on Coruscant. In the space battle that ensued over the Imperial capital, Dash's Outrider appeared to sustain critical damage from exploding space debris. It was all a trick of perspective and timing, however. Dash escaped, though he apparently decided his life as a Rebel had come to an end.